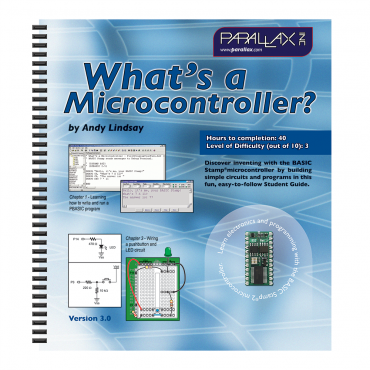 Home » What's a Microcontroller? Expo 2012 BASIC Stamp Activity Slides. Servo Circuit Connections for BASIC Stamp Boards. Wavelengths and their Corresponding Colors. Micro Music With RTTTL Example Code. Micro Alarm Prototype Example Code. Errata for What's a Micrcontroller? Text. Data Plotting with StampPlot Lite. BS2 Activity - Data Plotting with Excel. More hands-on activities with Stamps in Class Mini Projects. KickStart Examples for Sensors and Accessories. This entry-level tutorial introduces circuit-building and microcontroller programming at the same time with the BASIC Stamp 2, a tiny on-board computer like the ones found in many electronic devices. Discover how common components work as you go step-by-step through 40 hands-on activities in this 350-page text. Side-by-side schematics and wiring diagrams give you confidence in building the circuits, and each example program is followed by a detailed explanation so you learn as you go. What's a Microcontroller? is the foundation text to our Stamps in Class series, and an excellent resource for STEM programs. This text is suitable for students at the juior high, high school, vocational school, and college level, as well as the independent learner. The activites require a BASIC Stamp development board and electronic components. See Details below for complete kit options. Building simple circuits with schematics and wiring diagrams. Writing programs in PBASIC to control the circuits. Sending signals by blinking LEDs. Reading a dial using a potentiometer. Measuring light with a phototransistor. Controlling motion with a servo motor. Playing tunes on a piezo speaker. Displaying data on a 7-segment LED. Combining several circuits to prototype an invention. Dimensions: 8.3 x 8.5 in (21 x 21.6 cm). Spiral-bound softcover/ 354 pages/ black & white.